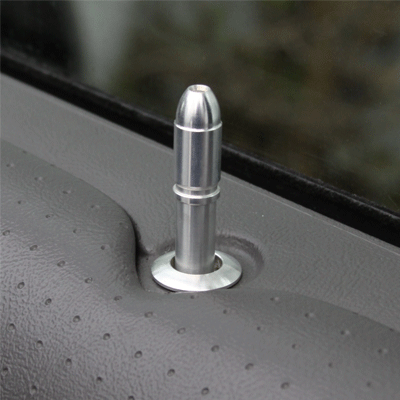 Innovative Bold Styling: Replace your chipped or worn out old plastic door pins and door pin bezels with our Bullet Billet Door Pin & Bezel Kit to make your door look brand new and trick. Quality Construction: Crafted to replace the factory pieces, while giving you the bold clean styling of our aftermarket Dress Ups for your American Muscle Car. Installs in 5 minutes. Fits these Vehicles: 1979 1980 1981 1982 1983 1984 1985 1986 1987 1988 1989 1990 1991 1992 1993 1994 1995 1996 1997 1998 1999 2000 2001 2002 2003 2004 Cobra GT LX 5.0L 302 Mustang Saleen & Steeda Vehicles. Made in the USA!